This is seed-saving season. At this time of year a dress/tunic over jeans is my favourite plot-wear. Primarily because it makes a handy bag for bean harvesting, and for catching beans as you shell them. Which I could happily do all day – there is something incredibly satisfying about cracking open brittle pods and liberating shiny, rattly beans. 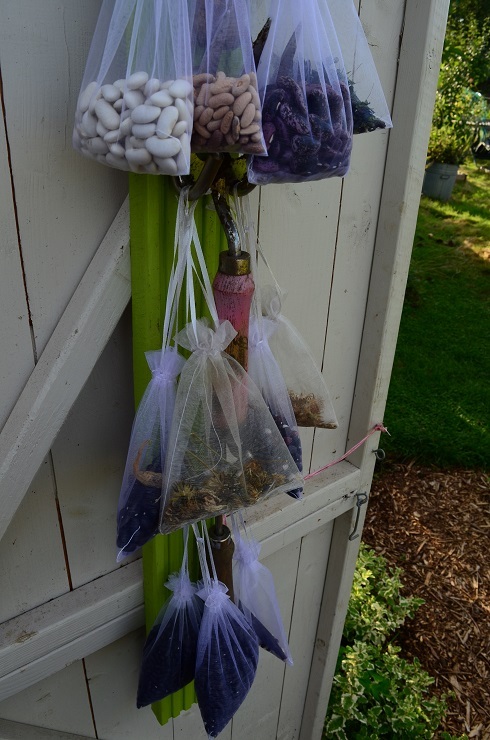 The shed door is festooned with bags: Cherokee Trail of Tears, 2 types of runner, Black Coco, Purple Teepee, Inca Pea Bean (and its misbehaving sibling) and the beginnings of Monachelle di Trevio. I hope the latter haven’t crossed with the CToTs. I grew them next to each other, but they flowered at different times so I’m hoping it’s all ok. Still to come are the Cara la Virgen de la Bañeza León beans, or Caras, as that’s such a mouthful. They are prolific but also the very last bean to appear. Fingers crossed the rest of the month stays warm and dry (though not as hot as yesterday thankyouplease!). With the late heat my chillies are putting on a spurt. I’m not quite sure what we’ll do with them all, but they really are pretty. Bulgarian Carrot, Fish, Hungarian Black Wax, Orange Wonder, Rob’s Chilli ‘B’ and Trepadeira Werners are at varying stages of ready. 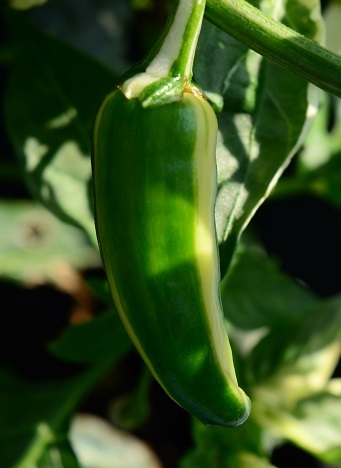 The Fish chillies in particular are stunning, with variegated fruits and foliage. I need to check the various net bags to see what I will have by way of seed offerings. I am getting really rather excited about the future yacon harvest. I can tell that tubers are starting to develop – not just because there’s one appearing near the surface but also the compost level in the pot has risen. 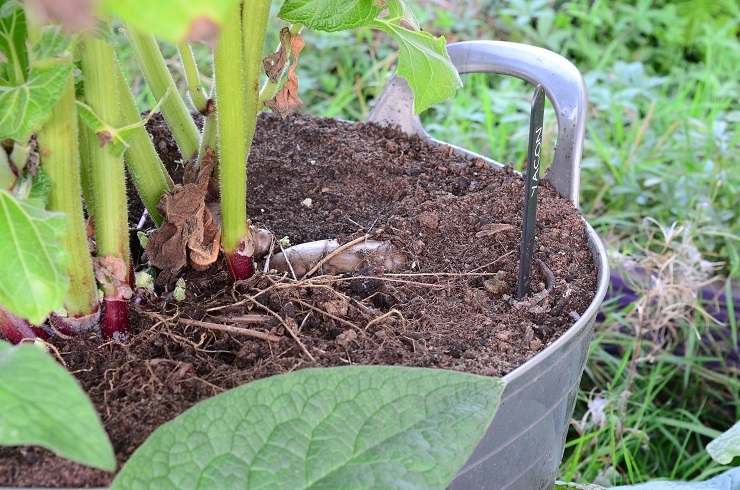 I planted the infant yacon with a good inch or two of space at the top of the pot. 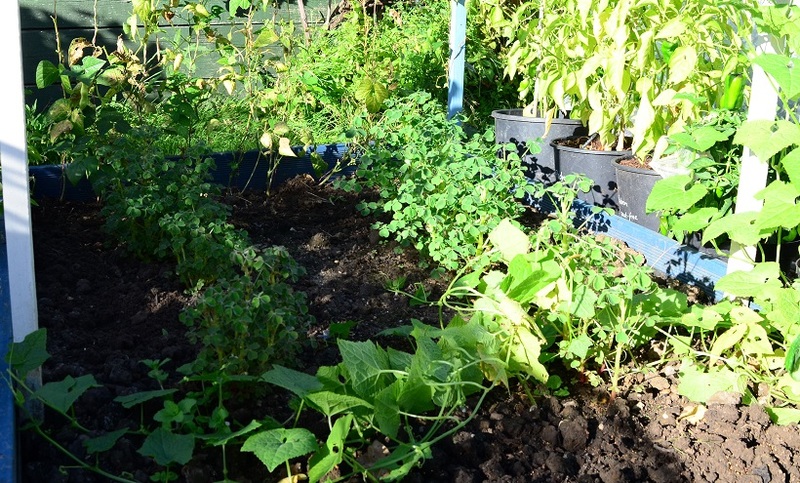 That space is long gone – compost is up to the edge of the pot and starting to spill over. It was fed today – surely it can’t get any bigger?! 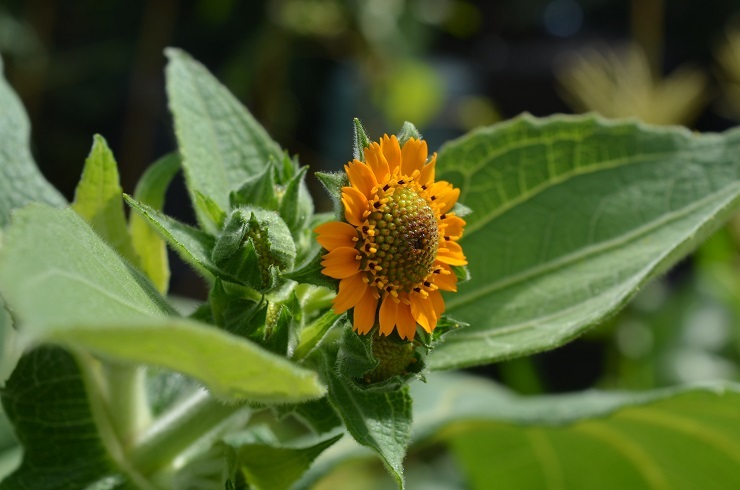 It’s also flowering away like mad, with sprays of little yellow flowers the bees seem to adore, echoing the sunflowers a few feet away. Not that there are many sunflowers left to be seen. 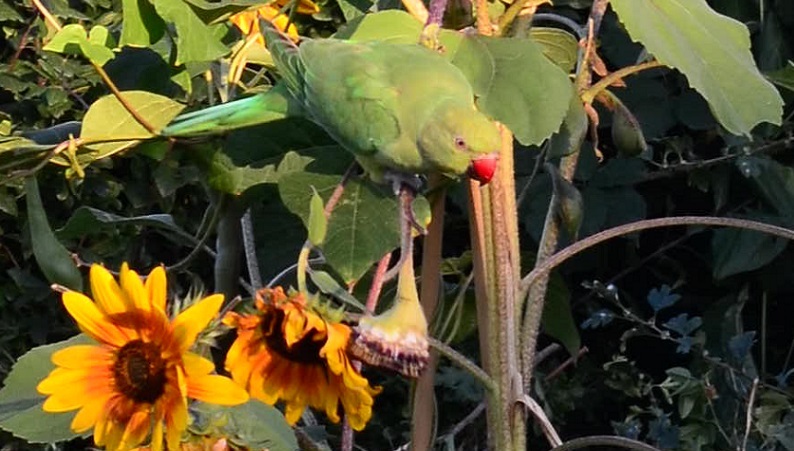 The birds, and particularly the parakeets, are eating the heads as soon as seeds develop. They squawk indignantly and flap off when I get near (hence pixelly photo), but as Wendy’s got sunflowers next door they don’t have to go to much effort to continue their lunch. As the summer beds are cleared and I resist the temptation to plant yet more brassicas, I’m sowing green manure. The old onion bed has had phacelia tanacetifolia broadcast over it, and, from the patchy distribution of the seedlings, my technique needs work! My rubbish squash plants, together with borage & cerinthe have been cleared from the blue bed and replaced with what I hope will be crimson clover soon enough. The packet was way past its sow-by date, but little things like that don’t deter me…Still growing away are Crimson Crush tomatoes. I am still really impressed with them. They aren’t as big as last year’s, but it looks like I will have a steady crop at least as far as late October, frosts willing. At the other end of that bed is another winter crop. I have 6 little ocas bravely doing their best, but I didn’t plant the tubers till the very end of July so if I get anything at all from them I will be lucky. I should probably be charged with crimes against oca. Next year I need to plant out earlier! 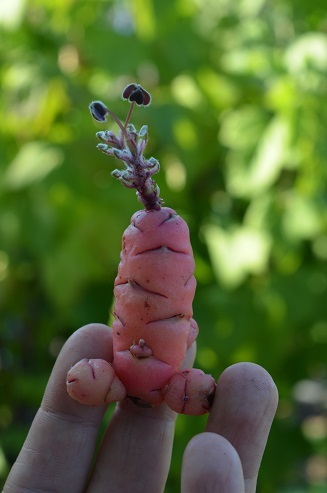 Given that the internet is currently full of rude veg pictures, mostly carrot-based, I though I’d add one of the oca showing it, too, can play its part…If you are of a sensitive nature please look away now. 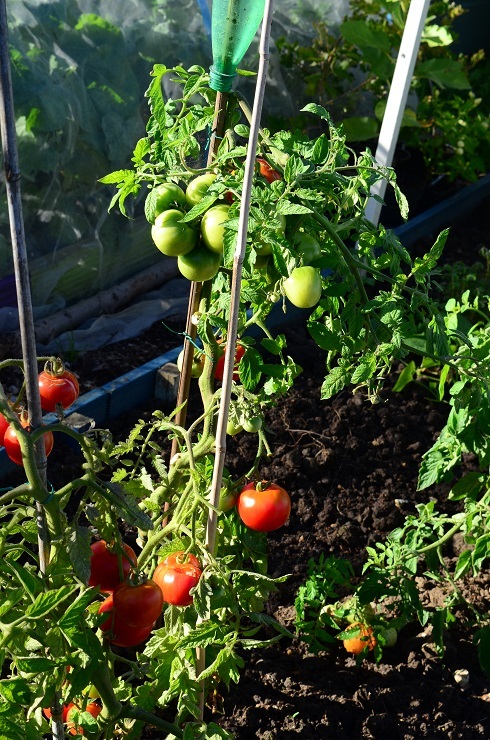 After a really traumatic start tomatoes are ripening thick and fast. I have a full dehydrator whizzing away, and will be starting on sauces for the freezer soon. The picture on the left has 2kg of them, with 8 varieties on show. Clockwise from the top left corner are: Red Buffalo Horn, Sosulka Oranzheraya (Orange Icicle), Sweet Aperitif, Purple Ukraine, Blush, Kenilworth King George, Red Zebra and Burpees Jubilee. And then there are the quinces. About 23 left on the tree, which is listing into the path a bit from the weight of its inaugural fruit. They are all still steadfastly green, with bits of fuzz remaining here and there. And they are apple-shaped rather than the pear I was expecting. But their ripening is much anticipated. Thank you! I can’t wait to try the yacon. How big is your quince tree? Mine’s only just shy of 7ft at 6 years old. You’re very lucky – I waited 4 years for fruit on mine! Hi Beryl. How did the experiment with the transplanting of that Apple tree work out for you? It’s very definitely alive and thriving. Only 6 apples this year but there was a late frost when the blossom was out. Am very pleased with it/myself. Fantastic! Glad it survived. Here’s to a bumper crop next year.